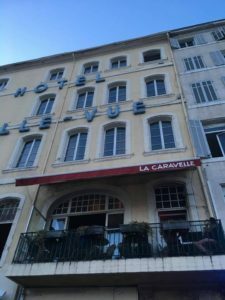 In to the heart of Marseille, the bar-restaurant La Caravelle open every day from 7 am to 2 pm. 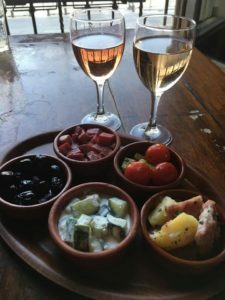 Free tapas from 6.30pm to 9pm. Jazz concerts and appetizers to enjoy with friends, whether you are from Marseille or just passing by, La Caravelle is a bar that goes through ages. 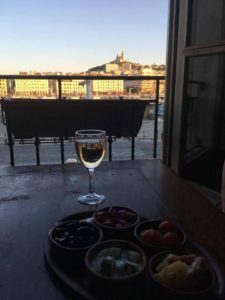 A conviviality that makes the memory of Marseille. A popular sunny balcony with a stunning view on Notre Dame de la Garde and the vieux port at your feet! To join the bar-restaurant la Caravelle walk along the pedestrian Old port edged with masts, look up and you will see people having a drink on the balcony, in a few minutes, you’ll be with them, a glass of pastis in your hand. Because that is the secret of the longevity of this cabaret since the 20s; being the gateway between generations and origins. 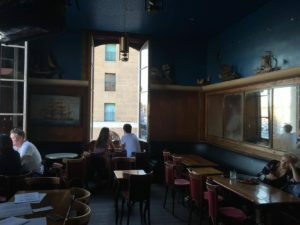 That mythical bar, attended by sailors, has today become everybody’s bar. Enter the Bellevue hotel, climb up the first floor and push the door of the bar-restaurant La Caravelle. Over the day, customers of all generations chat over coffee, tea of cold drinks, in a jazzy atmosphere. Some type on their laptop, some others read French and foreign press at disposal. Music lovers can play the piano. Eco-friendly, the place has obtained, jointly with Bellevue hotel, the international label The Green Key. Water, energy, waste, responsible purchases and awareness of clients and staff. Jazz with all its brightness. 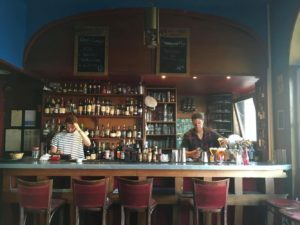 A sailor bar, woody walls, and concerts 2 times a week, 3 euros per person. New artists or regulars on Wednesdays and Fridays!